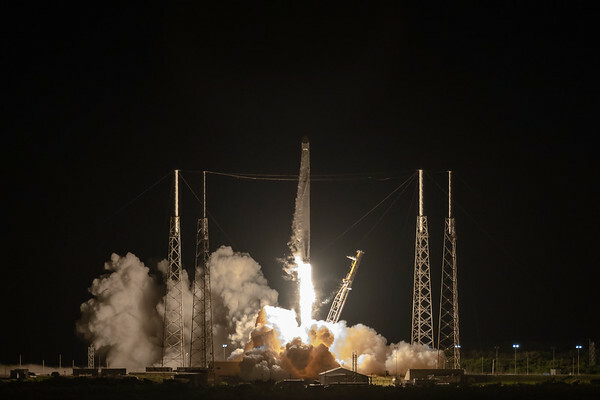 At 5:42am (ET) on Friday, June 29, Elon Musk's #SpaceX successfully launched almost 6,000 pounds of payload bound for the International Space Station. The rocket was previously flown, as was the Dragon capsule. 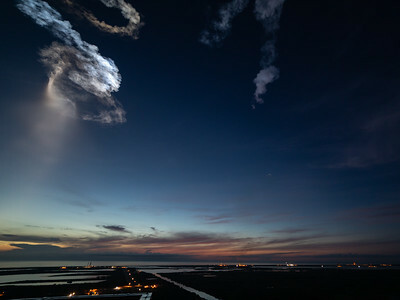 The launch took place approximately 45 minutes before sunrise, and the downrange plume was brightly illuminated by the sun. 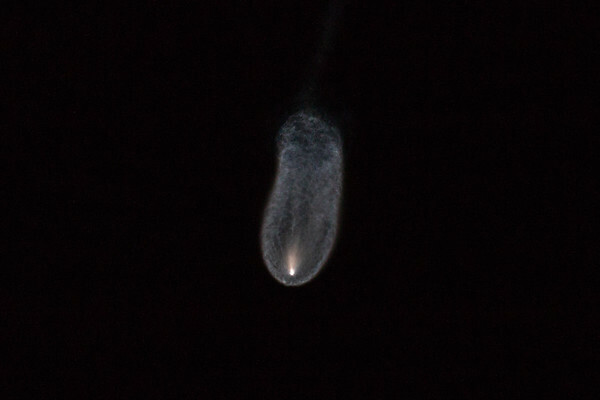 Liftoff of the #CRS15 #Falcon9 by #SpaceX, as seen from the roof of NASA's very tall Vehicle Assembly Building. (Photo me / We Report Space) — at Kennedy Space Center. Downrange plume from the #SpaceX #CRS15 #Falcon9. It is being lit by the sun, rising on the horizon. (Photo me / We Report Space) — at Kennedy Space Center. So this was a lucky shot, one of two taken by a sound-activated camera set at the pad approximately 12 hours before the #SpaceX #CRS15 #Falcon9 rocket would launch. It was very rainy when we were setting up the cameras, which was a problem, but the biggest challenge (for me at least) was not knowing exactly where the rocket would be, as it was horizontal when we were there. So, I pointed the zoom lens at where I thought the rocket would be and crossed my fingers. For the focus, I realized that I still had my focus ring taped from the last Falcon9 launch. Since I was setting the camera in approximately the same location, I just left the focus ring where it was. Frankly, I'm surprised I had anything in the frame... (Photo me / We Report Space) — at Kennedy Space Center. CRS-15 by SpaceX - Final, final edits. Wow. 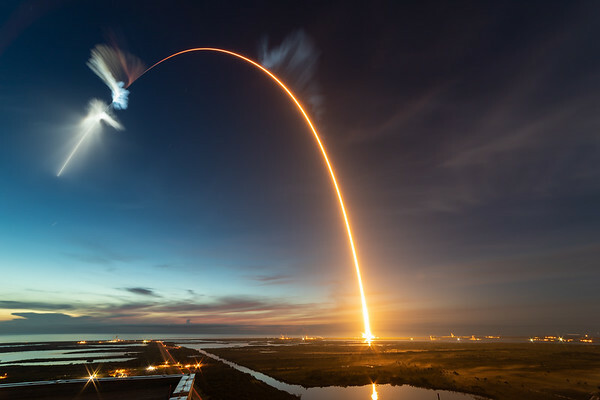 Edit: Now that I'm at my computer, and the adrenaline has calmed (just a bit), I can properly describe this shot: this is a 277-second exposure of the #CRS15 #Falcon9 rocket launched by #SpaceX at 5:42am this (Friday) morning. The plume was illuminated by the rising sun, and it was just amazing. Details: ISO100, 277-seconds, f18 shot with a Canon​ 5D4 and a Rokinon 14mm lens. (Field edit from the roof of the VAB, pic: me We Report Space​) — at Kennedy Space Center. I was extremely fortunate to have a very cool vantage point for the #SpaceX #CRS15 #Falcon9 launch early Friday (June 29) morning: 526 feet in the air on the roof of NASA's iconic Vehicle Assembly Building. During the day, the view is just incredible, but at night (or early morning), it is dark on the roof. Floodlights light the rocket on the pad (SLC-40, 4.75 miles away), but everything else is dark. Save for some aviation lights mounted to the building, flashlights we carry with us, and, in this case, a nearly Full Moon behind us, a small group (Craig Bailey captured a great shot of a few of us shooting the spectacle; it's in the Florida Today gallery) waited in the dark to be amazed and delighted. 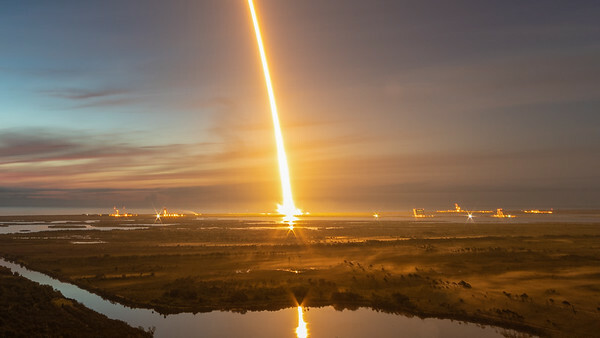 At 5:42 am the rocket ignited, bathing the Space Coast in light. Although I am aware of how bright this light is, and I know how it (briefly) affects things (see: Chris Gebhardt and the 15-foot alligator), seeing it from above is fantastic. 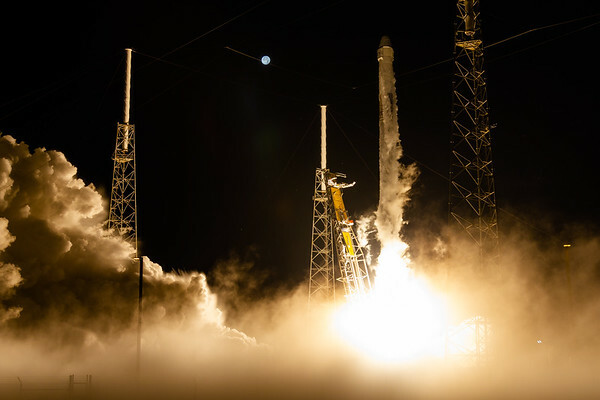 At the time of launch, a thin layer of haze had begun to settle over the area, and (in addition to being an irritant to everyone shooting at ground-level) it served nicely as a palette onto which the bright light of ignition cast sudden and long shadows. 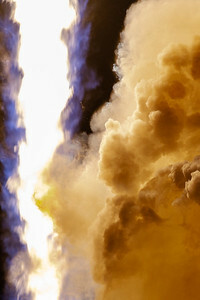 As the rocket climbed toward space, the shadows moved, growing shorter. It was a hypnotizing dance that caught my eye shortly after the rocket cleared the tower (and my initial frame), as I was removing the camera from the tripod to get ready for the epic downrange plume. 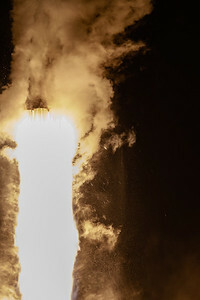 Although the plume lit by the rising Sun was undoubtedly the signature feature of this launch, watching the light move across and interact with the land below will, for me at least, be a very memorable thing. This tight crop of my streak shot doesn't do the scene justice, but you can make out the haze and some faint (and sadly, not moving) shadows from trees and such. Too Long; Didn't Read: Rockets are bright. (Pic: me / We Report Space) — at Vehicle Assembly Building. This was the pad shot I was hoping for: a wide view of the #SpaceX #CRS15 #Falcon9 rocket, with the very bright 98.5% illiminated (and one day post Full) Moon looking down on the scene. What I hadn't counted on was the enormous LOX cloud blanketing the ground. Initially I was a disappointed by the lack of definition in the foreground, but now it's grown on me. For reference, I used a cool, similar shot by Ben Cooper; this shot has certainly been done before, and Ben's shot is really great. Also of note, Bill Jelen did an amazing sequence, with the Moon marching toward the pad in 5-minute increments before the launch. And, no, this is not a composite. I realize the Moon looks like it was placed in the frame after the shot, but it really was that bright at the time of launch. (Photo me: We Report Space) — at Kennedy Space Center. Aftermath: Downrange plume from the #SpaceX #CRS15 #Falcon9. It is being lit by the sun, rising on the horizon. (Photo me / We Report Space) — at Kennedy Space Center. 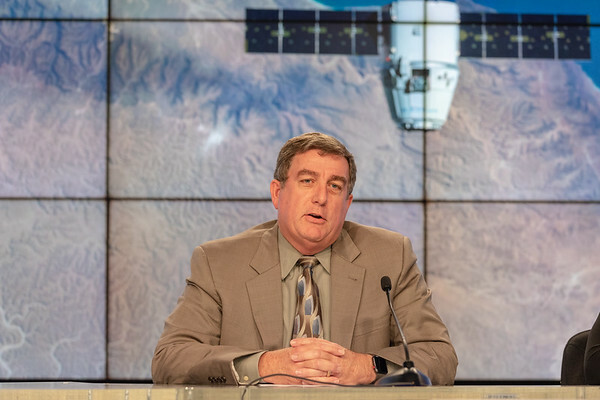 From the #CRS15 #SpaceX post-launch news conference, Kirk Shireman (program manager for the International Space Station) opened the conference with a salute to the press (following the shooting at the newpaper in Annapolis) and then spoke about the successful launch. (Photo me / We Report Space) — with Kirk Shireman at Kennedy Space Center. 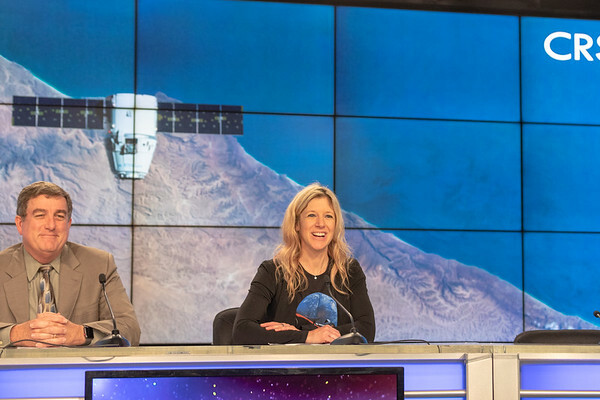 From the #CRS15 #SpaceX post-launch news conference, Jessica Jensen, director of Dragon mission management for #SpaceX, spoke about the successful launch. 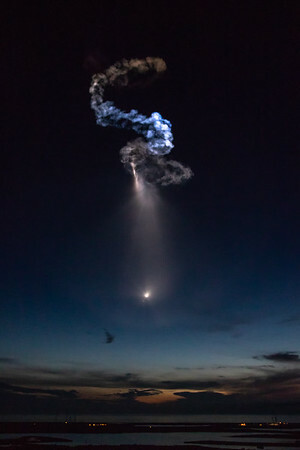 She aptly referred to the downrange plume illuminated by the Sun as "space jellyfish." (Photo: me/ We Report Space) — at Kennedy Space Center. #CRS15 #SpaceX post launch news conference. 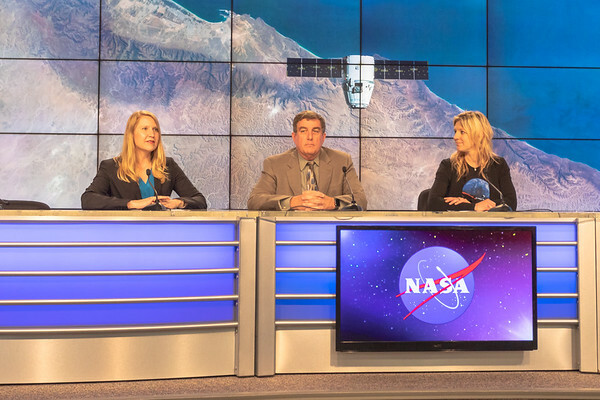 (Pic: me / We Report Space) — with Kirk Shireman and Jessica Jensen at Kennedy Space Center. CRS-15 by SpaceX - Final, final edits. 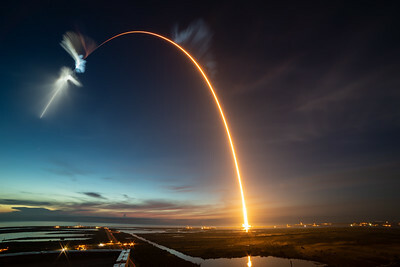 Edit: Now that I'm at my computer, and the adrenaline has calmed (just a bit), I can properly describe this shot: this is a 277-second exposure of the #CRS15 #Falcon9 rocket launched by #SpaceX at 5:42am this (Friday) morning. The plume was illuminated by the rising sun, and it was just amazing. Details: ISO100, 277-seconds, f18 shot with a Canon​ 5D4 and a Rokinon 14mm lens. (Field edit from the roof of the VAB, pic: me We Report Space​) — at Kennedy Space Center.